I hate when too much work coincides with abnormally warm winter days, meaning we didn't even have time to jet out for lunch outdoors, poor us. Online ordering to the rescue! 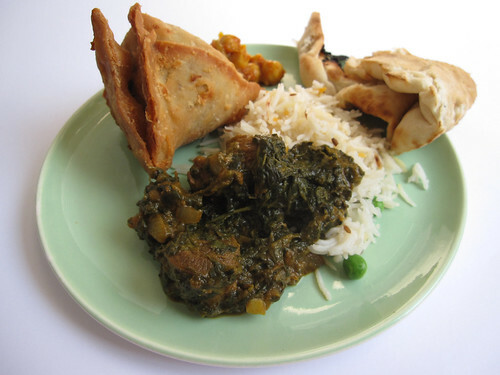 This is the deal - order one lunch special from Baluchi's online, use this coupon code BL500 (15% off good until the end of March) and then happily share with your lunch mate: 1 piece of naan, a container of basmati rice, a pint of lamb saagwala and 2 vegetarian samosas. It's not the best Indian food around but for a whopping $13.77, the portions are sufficiently tasty and more than sufficiently divisible by 2. I love that you included the price. I wish you'd do that for everything.